WORK is under-way in Molesey to replace all orange glow street lamps with modern energy-efficient white lamps, but concerns are being raised over the loss of the town’s distinctive 20th Century posts. Surrey County Council has agreed a 25-year deal with its contractor Skanska to replace, upgrade and maintain 89,000 streetlights across all 11 Surrey boroughs. The project is being financed by a Government grant and is intended to save 60,000 tonnes of carbon across the county and ‘at least £12 million’. The new lamp-posts will use mobile phone technology to communicate with a central computer in Guildford, allowing faults to be automatically detected and for the lights to be dimmed remotely to save electricity. The white lamps are also said to deter criminals by illuminating the streets better, and create less glare into homes. The Molesey News understands that posts under 15-years-old will have their heads swapped, but around 70,000 older posts will be uprooted entirely. 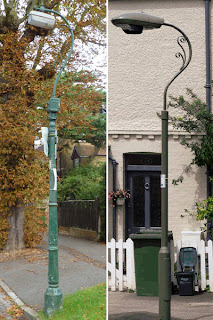 In conservation areas such as Molesey’s Kent Town (encompassing Palace Road and other streets close to Hampton Court) Surrey plans to install ‘heritage style’ swan-necked lamp-posts, although residents will be consulted on their preferred choice of heritage design. People living outside the conservation area will be able club together if they wish to pay the extra £150 per post for a swan neck design. Steve Bax of the Molesey Conservative Residents said: “We welcome the opportunity for the county to reduce its carbon output and save taxpayers millions in electricity payments. But in looking to the future we shouldn’t abandon our past. After making enquiries the Molesey Conservative Residents were told by the county council that “upgrading the old high level gas service columns is not something we could consider”. They say energy suppliers will no longer work on the older columns on health and safety grounds, and claim posts would need to be transported to the North of England to be upgraded, at a cost of £3,000 to £4,000 per column, rather than carrying out upgrades at street level. The MCR is working with local residents to investigate other alternatives, but we want to hear your views. What do you think? Should Molesey’s older style lamp-posts be saved or should the modern replacements be embraced? Click on this article's headline for the comments box.